Warnings: If symptoms worsen or persist for more than 48 hours, Consult a health care practitioner. 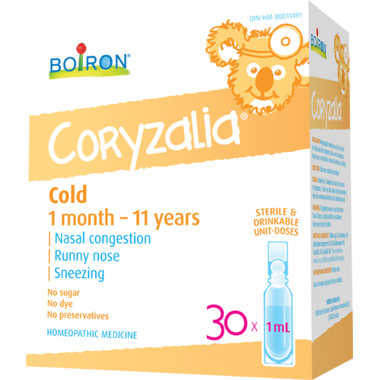 Other Info: Coryzalia does not require any special storage conditions prior to opening the aluminium pouch.. If you use right at the sign of cold symptoms - sneezing, coughing, sniffles - it actually works! We have dodged a couple colds already!! I have a 3 mo old with a runny nose and a 3 yr old with a stuffy nose. Somehow this product is able to provide relief for both. Love it! Can't say enough good things about these products!! My little one will actually take them no problem and they really seem to help. Really helps stop runny noses! I like to keep these in stock at home and give them to my kids at the first sign of a runny nose/ sneezing. super easy to drink and reduces runny nose. can get expensive as may require to be taken for long duration. very helpful especially for young babies. My kids have allergies. This helps stop the runny nose. We have a constant supply all year round. I use this for my 8 month old. It doesn't completely stop the runny nose but does lessen it. Using as directed, magically clears up my baby's runny nose in a few days. I have used these for years and have found it to be a great item for toddlers and colds/runny noses. The cold doesn't last as long or so it seems. I have been using this for a few years. When my kids show signs of a cold, I give them this as per the instruction. To be honest I don't have other kids to compare how fast they recover from cold symptoms, but this seems to get my kids better. I use the adult version of this for myself when I have a cold. I always have them in my medicine cabinet at home.